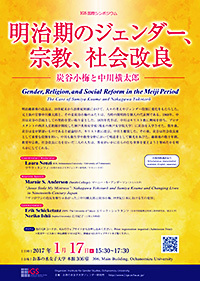 The reforms that followed the Meiji Restoration propelled changes in gender roles and subjectivities across the late nineteenth and early twentieth centuries. The case of two reform-minded individuals—bureaucrat and former samurai Nakagawa Yokotarō and his concubine Sumiya Koume—offers a case in point. In 1868, Nakagawa bought out Sumiya’s geisha contract and made her his concubine. In the mid-1870s, Nakagawa became interested in Christianity and sent Sumiya to Kobe College, an institution run by western Protestant missionaries. Sumiya decided concubinage was sinful, converted to Christianity, and left Nakagawa a few years later. She went on to play a prominent role as a social reformer in the community. Nakagawa too enjoyed a high profile as an advocate of hygiene and education. Together their lives illuminate how men and women worked to transform their world in the decades after the Restoration by focusing on education, religion, and social reform.